ATLAS MISALIGNMENT IS THE MOST COMMONLY OVERLOOKED CAUSE! 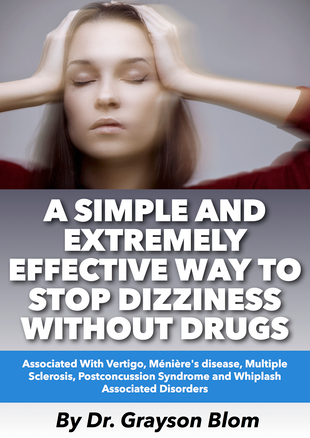 Are You Suffering With Dizziness, Vertigo, Meniere's Disease? Atlas Misalignment Is A Common CAUSE! Is There A Connection Between Head and Neck Injuries and Dizziness, Vertigo, Meniere's Disease? Do you have recurring episodes of dizziness that can be quite severe? This can give you a sensation of spinning or moving? Do you suffer from nausea or vomiting? Do your symptoms get worse with movement? Changes in HEARING? Pressure or a sensation of fullness in the EAR? Ringing or maybe even a roaring sound in the affected ear? As you are probably well aware Meniere’s Disease or Vertigo is a potentially debilitating disease. The sensation of spinning along with tinnitus and hearing loss that can fluctuate. It can be very upsetting and frustrating not knowing if it will every go away or if you will be able to function normally again? At this point in time the main medical strategy is to throw drugs at it to cover up your symptoms. Please understand that this does not fix the problem it is only masking it. And now you have to deal with the side effects of the drugs, etc. About 120,000 people die every year due to drug complications according to the American Medical Association. Please note that this is taking drugs as prescribed with accepted drug treatment protocols. An Injury To The Head or Neck Can Result In? Misalignment of One of The Upper Two Neck Bones! Please also consider the relationship between your head and the upper two neck bones. This imbalance of the head on the spine not only puts pressure on the nerves that go to the head and neck, it also causes the muscles at the top of the neck to tighten up and/or spasm. Let's think back for a moment, as far back as 10-15-20 years. Have you had any slips or falls? Have you had any work injuries? Have you had any sports injuries? Have you ever experienced any trauma (minor or major)? If the answer is YES to any one of these then your current condition may in fact be due to a previous injury to the head or neck that resulted in a misalignment of one of the upper two neck bones! ﻿﻿﻿﻿Dr. Grayson Blom works with a nationwide group of Doctors expertly trained and specializing in the Upper Cervical procedure. Dr. Grayson Blom is also one of the few Doctors in the state of Idaho trained and certified in the Upper Cervical procedure. We are dedicated to helping patients just like you who suffer from chronic vertigo, Meniere's disease, tinnitus, headaches, migraines, neck pain, shoulder pain, back pain and other spinal-related disorders. And right now, our office is offering a COMPLIMENTARY CONSULTATION to determine if you are a candidate for Upper Cervical care. Take the first step toward reclaiming your health… Call our office ﻿(208) 559-0541 ﻿or fill out a consult request form.